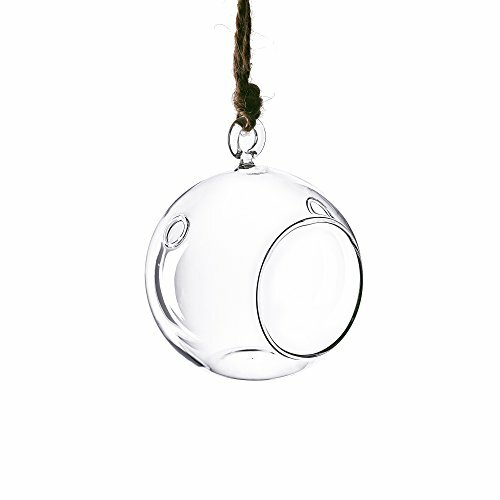 Mini Plant Terrarium Glass Containers, Terrarium Glass Orbs. Dimension - Height 3.25 inches, Body D-3 inches, Pack of 6 pcs. Made of Clear Glass, Terrarium can be sit on flat surface. The hook on top is for Hanging Terrarium Purpose. Perfect terrarium container for planting succulent, airplant and cactusCYS TM register products! Please do not buy from other sellers except (CYS Modern Vase & Gift), because we will not responsible for any complaint due to the differences of the item or products! sold by different sellers! H-3.5" Body D - 3"
Add these airy and light DIY terrarium planters to any area in your home. This set of hanging geometric planters allows you to mix and match with décor ideas, and get creative with the look. Set does not include plants or decorative items. GeoTerrariums plant holders bring elegance to wedding tabletop décor, centerpieces, & favors, parties, birthdays, and make perfect gifts for gardeners, loved ones, or housewarmings. CYS EXCEL - A Leading U.S. Glass Vase Wholesale Direct Importer since 1997. Specializing in high-end glassware and vases. Our mission is to provide our customers with trendy hand-blown glass vases and home decoration. Our product lines are perfect for all kinds of events including weddings, centerpieces, anniversary and many more gift giving holidays. Color: H-3.5" Body D - 3"